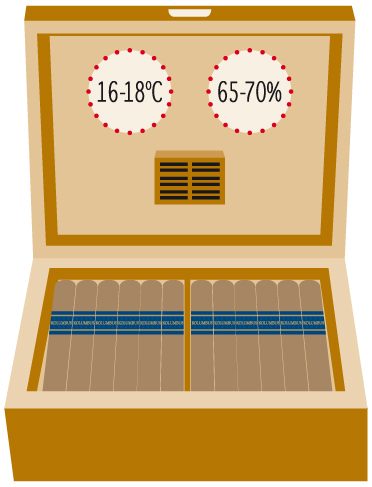 Keep your KOLUMBUS cigars in a Spanish cedar humidor at a constant temperature of 61-65°F (16-18°C), and relative humidity of 65-70%. 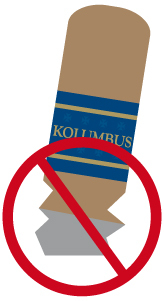 Do not place the cigars in the fridge as they can dry-out and absorb fridge odours. Before getting started, roll the cigar between your fingers, smell it and let yourself be wrapped in its aromas. It is advisable to light the cigar before cutting so as to accentuate the flavours and the taste of the first few puffs. If you use long cedar matches, wait till the phosphorus burns off before using it to light you cigar. If you use a lighter, use a butane gas one. The gasoline based ones impart a foul flavor to your smoke. The best way for lighting up is a cedar spills. A cedar spill is a long thin strip of spanish cedar which is lit first and then used in turn to light your cigar. It is a rather elegant way to light your stogie. Preheat the foot by slowly rolling the cigar above the flame at an angle allowing a tiny black ring to form all the way around the wrapper. Don’t allow the flame to touch the cigar. 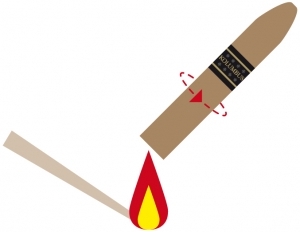 With the cigar in your mouth, and drawing in as you repeat the process, slowly roll the cigar at an angle above the flame, without letting the lighter flame actually touch the cigar. Remember to slowly spin the cigar to ensure an even burn. Once it is fully lit, pull it away from your mouth and check if it lit properly. If the burn is really uneven, repeat the previous step on the appropriate side to even the burn. You can also gently blow on the end in the appropriate place to intensify the heat there, take a couple steady draws, then just wait a minute before continuing to puff. This short delay allows the cigar a chance to stabilize and self correct the burn. 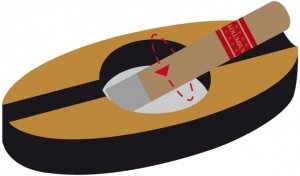 If the cigar seems to be extinguished, just knock off the ash, gently blow through the cigar to clear out the old smoke, then jump right to the drawing while rolling part of the light up sequence. Firstly, it is very important to make a clean cut so ensure you have a quality cigar cutter. A clean cut made with the right tools and in the right place will decrease your chances of having the cigar unravel, which may make for an unpleasant smoke. A clean cut is the key. At the head of the cigar, you will see the cap, a round piece of tobacco that is glued to the head to keep the wrapper together. This cap is put on the head of the cigar during the hand-rolling process to keep it from unraveling and drying out. You should see a distinct line where the cap ends. To ensure a clean cut and to avoid tearing the wrapper, cut just before the cap leaving 3 mm. For the best results, try making one quick, strong movement. Find your mark and clip it quickly. Ensure the blades are sharp so that there is no tearing involved. 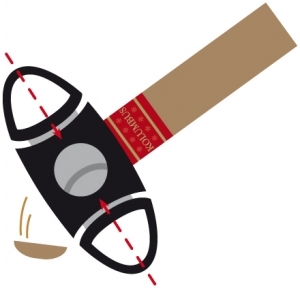 Cutting your cigar correctly means you will have a better tasting smoke. Holding a cigar is not like holding a cigarette, though many attempt to hold them the same way. 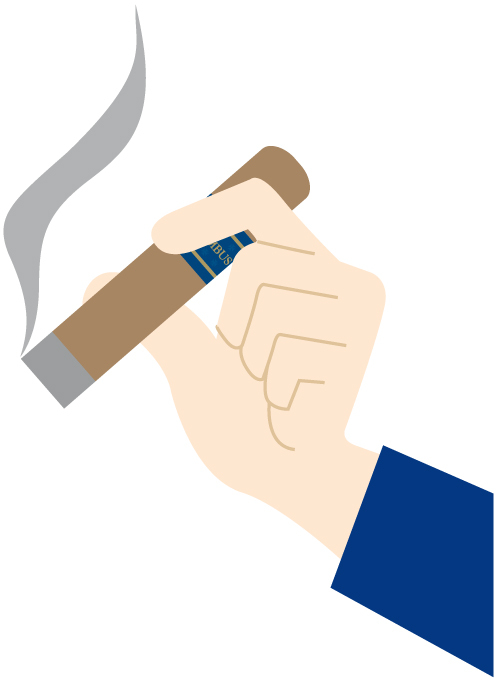 A cigar should not be held between your index and middle finger like a cigarette, instead hold it between your index finger and thumb always holding it parallel to the ground. Many have wondered if you should remove the band from the cigar. It is really a personal choice to remove the band of the cigar, but do consider that in certain places it is considered rude to advertise the brand you’re smoking, unless someone is inviting you the cigar. If you decide to take off the band, wait until you have smoked the cigar for a few minutes. The heat will make the gum on the band less adhesive and easier to remove without tearing the delicate wrapper. First and foremost enjoy your cigars in moderation and consider the amount of time you have to smoke. If you are going to have a lot of time to enjoy your cigar, then you might want to light up a Robusto or Piramide by KOLUMBUS, which are generally larger and thicker cigars that will last longer. A Piramide with a large ring size will usually last more than an hour. If you don’t have an hour to spend enjoying a cigar, then smoke something smaller like a Robustito by KOLUMBUS with a smaller ring gauge. Another option may be to have a mild to medium bodied cigar during the day and at night choose a full bodied cigar. To appreciate it perfectly the smoke should not be inhaled, just hold the smoke for a few seconds in your mouth; only in this way will you be able to appreciate its taste and unique organoleptic characteristics. Inhaling repeatedly will overheat the cigar. 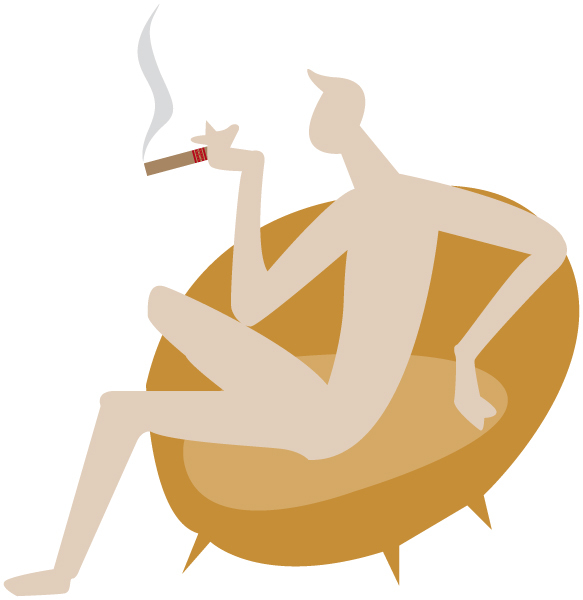 Sitting quietly by yourself outside of your home, or maybe you have the good fortune to have actual ‘smoking lounge’ set up within your home. The ultimate way to enjoy a cigar is sitting outside having some good conversation with family and/or friends after a fine dinner or during a special occasion. Especially if you have nice porch. Now, decide which beverage you would like to sip on while enjoying your cigar. Some of our suggestions would be a nice malt whiskey, brandy or aged rum on the rocks, or a glass of wine (red or white). Never tap the cigar to drop the ash, it enables the cigar to burn at the right temperature. Wait until there is 2 cm of ash, not more. Otherwise, it will block the air-flow and the combustion will be irregular. Once you have enough ash, place it on an ashtray and gently press the ash-end of the cigar while slowly rotating it. Indulge yourself in the concert of aromas and flavours, savouring the pleasure of the last third. Once you have reached the final moment, never crush your cigar in the ashtray. Instead, give it a worthy ending by placing it on the ashtray and letting go out by itself. And throw it away soon to avoid impregnating the room with the tenacious odor of cold tobacco. *To see the infographic, click here.